Recessions can bring deflation, which is when prices go down year after year, Kirsner says. “Deflation may come as this credit-fueled bubble bursts and people spend less and borrow less,” he says. Craig Kirsner, MBA, (www.StuartPlanning.com) is a nationally-recognized author, speaker and retirement planner whom you may have seen on Kiplinger, Forbes, Fidelity.com, Nasdaq.com, U.S. News & World Report, AT&T, Yahoo Finance, MSN Money, Bankrate.com, CBS, ABC, NBC, FOX, Newsmax, Valuewalk and many others. 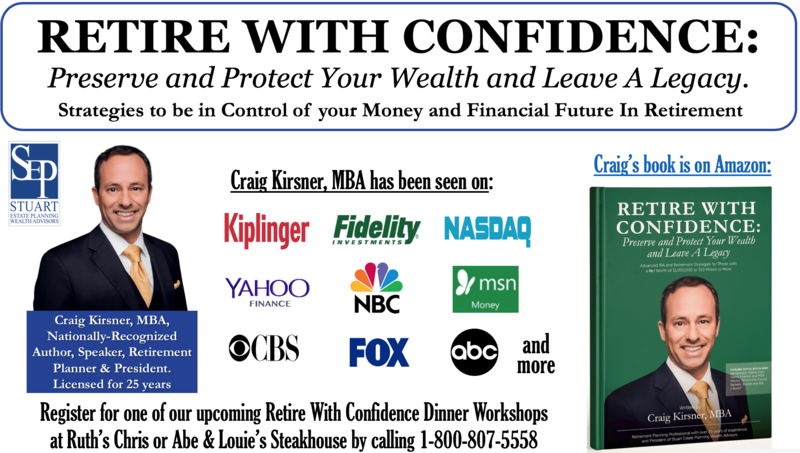 Craig is the author of Retire With Confidence: Preserve and Protect Your Wealth And Leave A Legacy and creator of the Preserve and Protect Retirement System. He has an MBA in finance from Florida International University. He is an Investment Adviser Representative who has passed the Series 63 and 65 securities exams and has been a licensed insurance agent for 26 years.